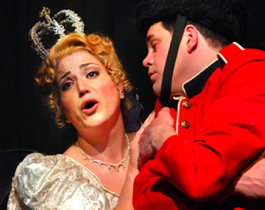 “Up in the sky-high, sky-high” sings the cast in the finale of “Iolanthe”, and that’s pretty much exactly how you’ll feel after watching this effervescent production from Toronto Operetta Theatre. Many Savoyards (as Gilbert and Sullivan lovers are known) consider “Iolanthe” the apex of the duo’s art--the fullest expression of Gilbert’s topsy-turvydom and Sullivan at his most inspired. It is remarkable that Ontario, and likely all of Canada, has not seen a professional production of this masterpiece of whimsy since the famed Stratford Festival production of 1984 designed by Susan Benson and directed by Brian MacDonald. In fact, it may be the very success of that Stratford production, now immortalized on DVD, that has inhibited others from trying to compete with it. The TOT has no worries there. While the Stratford production placed the action firmly within a 19th-century music hall and used Benson’s clever design to make reference to various music hall entertainments, the TOT takes a very different approach. With the TOT the music always comes first. The stage décor may suggest a general atmosphere, but never distracts from the music or creates visual jokes of its own. The result is the best-sung and the most clearly directed “Iolanthe” I have ever seen, and I have seen, among many others, both the Stratford production and the D’Oyly Carte Opera’s traditional production. To many scholars the operettas of Gilbert and Sullivan are closest that English theatre ever came to emulating the satiric comedies of Aristophanes. No less a classicist than Edith Hamilton (1867-1963) wrote of Gilbert and the Athenian, “The two men fooled in the same way; they looked at life with the same eyes. In Gilbert’s pages Victorian England lives in miniature just as Athens in Aristophanes’. . . . They saw beneath the surface of the passing show. They wrote of the purely ephemeral, and in their hands it became a picture not of the ‘Follies and Foibles’ of a day and nation, but of those that exist in all nations and all ages and belong to the permanent stuff of human nature”. “Iolanthe”, with its confrontation of the fairy world of nature versus the human world of law is the most Aristophanic of all G&S operettas. The conclusion when the House of Peers is exchanged for the House of Peris, an ascent to Gilbert’s own Cloudcuckooland, is the most radical in the canon since unlike “The Pirates of Penzance” of “The Mikado” it leaves the real world behind entirely. The TOT has fielded an exceptionally strong cast who realize that G&S are funniest when played absolutely straight. The most notable example of this is David Ludwig as Lord Chancellor. Ludwig makes him not clownish or dim-witted as is too often the case, but a formidable threat filled with the hauteur of his exalted position as his entrance song implies. The seriousness with which he takes the extraordinary happenings around him is what makes them funny. His statement to the Queen of the Fairies that he “took her for / the proprietor / of a ladies’ seminary” thus has the right degree of sneer. Due to his subtle acting we notice a pang of doubt run through him the first time he sees the veiled Iolanthe, a sense that grows with every subsequent encounter until she reveals herself to him in “My Lord, A Suppliant at Your Feet”. Another welcome change is the casting of Cory O’Brien as the simple shepherd Strephon, Iolanthe’s son. Strephon is a character more acted upon than acting, but due to O’Brien’s good looks, fine voice and forthright acting the character has much stronger stage presence than is usual. With the pert, bright-voiced Phyllis of Elizabeth DeGrazia, the lovely duet “You Shall Part Us From Each Other” carries a real emotional weight. Wendy Hatala Foley, commanding a wonderfully rich mezzo-soprano, makes an imposing Queen of the Fairies, looking and acting rather like British actor Janet McTeer in one of her regal roles. She delivers her famous aria “Oh, Foolish Fay” with wry aplomb, not to the London Fire Chief Captain Shaw of the original but to Stockwell Day. With Ludwig’s strong Lord Chancellor the forces of mortal versus immortal are well-balanced. Under Guillermo Silva-Marin’s direction the subplot involving Phyllis and Lords Tolloller and Mountararat is more clearly staged than I’ve ever seen. DeGrazia carries her anger at discovering Strephon with another woman (i.e. Iolanthe) into her scenes with the two lords so that her statement that she doesn’t care which of the two lords she marries is revealed not as a fickleness but revenge for Strephon’s seeming infidelity. Patrick Jang as Tolloller and Lawrence Cotton as Mountararat are well contrasted and give fine accounts of their big numbers. A further plus is the casting of the delicate but full-voiced Mia Harris as Iolanthe. For once Iolanthe does actually look as young, if not younger, than Strephon, thus making Phyllis’s and the Peers’ mistaken view of their relationship quite understandable. Silva-Marin stages her transgression of fairy law in revealing her identity to the Lord Chancellor with full seriousness so that the fairies cries of warning signal real alarm as they should. The result is that the reuniting of mortal husband with his immortal wife is truly moving. Directors too often forget how important it is to establish a real note of fear and melancholy at this point since it only makes the joyful release from them the greater. Aiding in creating air of fantasy are Lise Maher, Jenny Cohen and Catherine Rooney as the fairies Celia Leila and Fleta. Given the curly antennae on their shimmering costumes, Silva-Marin has decided that they should buzz and chirrup to punctuate their lines, a fanciful notion that enhances their otherwordliness. Last to appear, but not least, is Andrew Tees as Private Willis. It’s a real pleasure to hear his big song “When All Night Long a Chap Remains” sung in Tees’ rich operatic baritone. Silva-Marin’s simple design suggests that the action takes place not deep in a glade but in a manicured English garden complete with garden furtinure, a notion that lends its own irony to the scene and makes it adaptable to the Act 2 shift to London. Robert Cooper conducts the ten-member TOT band with verve and precision with especially fine work from the wind section. The whole company sing and speak their lines with such clarity that all of Gilbert’s clever word-play comes through. Let’s hope the TOT adds “Iolanthe” to its regular rotation of great operettas since I would hate to wait another 25 years to see this sublime work on stage again. Photo: Wendy Hatala Foley and Andrew Tees.